Umbilical granuloma is a small swelling composed of granulation tissue at the base of the umbilicus. It is a relatively common problem in neonatal period, encountering after separation of the umbilical cord. The granuloma is thought to develop in response to subclinical infection or inadequate epithelialization of umbilical cord stump. The main clinical symptoms are umbilical discharge and swelling. Physical examination shows a small, moist, fragile and pinkish/red lesion at the umbilicus. Besides some benign soft tissue tumors, vitellin duct anomalies or urachal remnants should be considered in the differential diagnosis. The issue of what is the best treatment option is still controversial. Although silver nitrate application is the most common one among the actual treatment options, other therapeutic methods are also available. These include common salt application, topical antiseptics/antibiotics/steroids, ligation, excision, electrocautery, and cryotherapy. At the current practice, common salt application is suggested if silver nitrate cannot be used as the first option. In patients with treatment-resistant cases, excision should be done after ruling out other potential diseases. A detailed work-up is needed if the lesion has equivocal clinical characteristics or do not respond to therapeutic interventions mentioned above. Umbilical granuloma is a commonly seen and benign abnormality in neonates. It is defined as a moist, fleshy and pink granulation tissue at the center of the umbilicus [1,2]. Characteristically, the granuloma becomes apparent after separation of the umbilical cord [3,4]. Whether it has a short root or a pedicle, the granuloma frequently secretes small amounts of fibrinous exudate. In many references, umbilical granuloma is reported as the most frequent disorder originating from umbilicus in newborns [2,3,5]. However, the number of credible epidemiological studies dealing with its incidence/prevalence is very limited. In one reference, prevalence of the umbilical granuloma has been reported as 1 in 500 newborns . In 1000 healthy newborns, Al Siny et al. studied the incidence of the umbilical granuloma in relation to two techniques of umbilical cord clamping after birth. While the incidence of umbilical granuloma was 8% (40 patients) in the first group (conventional clamping), there was no any umbilical granuloma observed in the second group (proximal clamping). Apart from cord clamping technique, frequency of the umbilical granuloma may vary with routine cord care and hygienic conditions. Simply knowing the gross structure of the umbilical cord and the natural progress of the cord separation is important in the etiopathogenesis. Umbilical cord normally contains one umbilical vein and two umbilical arteries which are embedded within a loose matrix known as Wharton’s jelly . Amniotic membrane surrounds these structures. Once the umbilical cord clamped during delivery, a rapid desiccation/separation process begins, the cord sloughs in time, and spontaneous separation of the cord is completed within 7-15 days [3,9]. Persistence of umbilical cord beyond 3 or 4 weeks is generally considered delayed . Under normal conditions (healthy newborn, proper hygienic care, etc. ), base of the umbilicus rapidly heals and becomes covered with squamous epithelium when the cord falls off [11,12]. Less frequently, there may be a very small granulation tissue at the base, which resolves within the days. Histopathologically, umbilical granulomas predominantly consist of fibroblasts, copious small blood vessels, endothelial and inflammatory cells in an edematous stroma. It has no neural elements [2,5,13]. There is a lack of evidence on the ethiopathogenesis of the umbilical granulomas. An inflammatory process is suggested for granuloma formation . A similar explanation which shows close relation with the delayed cord separation is the presence of an ongoing subclinical/mild infection in the umbilical stump [5,12]. According to this hypothesis, inflammation results in both overgrowth of endothelial cells and inadequate epithelization. Although the exact cause of umbilical granuloma is not known, formation of the granuloma can be related to both an inflammatory process and a delay in the umbilical cord separation. It is known that delayed cord separation may occur due to bacterial infections or some immune disorders (leukocyte adhesion deficiency, neutrophil motility defect, etc.) . Disruption of the balance between umbilikal skin flora and saprophytic organisms is also proposed to affect the separation of the cord by facilitating invasion of pathologic microorganisms [14,15]. These subclinic/local invasions may preclude skin epithelization and trigger granuloma formation. The most common symptoms are umbilical discharge and a small swelling in the navel. Umbilical granulomas typically seen in neonatal period and a careful medical history reveals that the symptoms begin after separation of the cord. A small amount of pinkish/yellowish discharge makes baby’s underwear dirty [2,3]. The discharge is often odorless and should not have any intestinal lumen content or urine. If the granuloma has a sufficient size or a pedicle, allowing seeing it from outside, complaint of swelling in the belly button accompanies umbilical discharge. Because the granuloma does not consist of nerve fibers, it does not cause pain and irritability unless complicated by infection. In physical examination, umbilical granulomas are seen as small (1 to 10mm in size), soft/friable, nontender, and pale pink/red colored lesions at base of the umbilicus [2,10] (Figure 1). The surrounding skin is normal. Its granular surface can be recognized by a careful open eye inspection or using an optical magnifier. Sometimes, to expose the sessile granulomas cannot be easy because of deep umbilical pit. In this condition, use of an otoscope or surgical pick-up to open out the umbilical pit ensures sufficient exposure. Figure 1: An umbilical granuloma. Characteristically, it is a small, pale pink-colored and moist mass (*) placing within the umbilical ring. Symptoms and signs of local infection (omphalitis) or sepsis such as edema and hyperemia in surrounding skin, purulent drainage, fever/hypothermia, and poor general condition may accompany to the clinical picture in neglected cases exposed to poor hygienic conditions. Most of umbilical granulomas can be easily diagnosed with a careful medical history and physical examination. Accordingly, high index of suspicion is essential in the presence of umbilical discharge and a granulation tissue. Although this condition frequently requires no further investigation, in some circumstances, use of additional diagnostic methods may be necessary [9,16]. For instance, contrast studies are helpful to rule out small vitelline or urachal fistulas/sinuses with mucosal protrusion. In case of clinical suspicion, ultrasonography may be helpful in identifying associated abdominal anomalies. Umbilical polyps which are covered with real epithelium poses a diagnostic challenge from clinical point of view. Polyps are remnants of intestinal, gastric or bladder mucosa appearing more bright and red colored. Because polyps and granulomas have similar symptoms and findings, clinical ground may not be distinctive . In this condition, excisional biopsy allows to establish accurate diagnosis as it provides definitive treatment. Whether the lesion responds to silver nitrate application may be used as a diagnostic tool. Omphalitis, benign soft tissue tumors (dermoid cyst, hamartoma, hemangioma, etc. ), vitelline duct anomalies, and urachal remnants should be considered in differential diagnosis [17-19]. Small polyps or superficial cysts originating from vitelline duct or urachus may resemble a granuloma. A small patent vitelline duct or a patent urachus causing minimal discharge may also mimic umbilical granuloma (Table 1). Table 1: The conditions which should be considered in the differential diagnosis of umbilical granuloma. In English literature, there are several cases which are initially misdiagnosed as umbilical granuloma and treated with silver nitrate. In this context, Kondrich et al. reported a case of evisceration of small bowel after cauterization of an umbilical mass, and Montes-Tapia et al. published a patient with appendico-umbilical fistula presenting with umbilical mass and drainage. When principal textbooks on pediatrics and neonatology were reviewed, it is remarkable that silver nitrate application is advocated as a first line treatment option, and other non-invasive approaches almost are not mentioned [12,22,23]. However, literature search supports presence of different management options although evidence based ones are limited. The reasons for seeking these alternatives are I) some unresponsive cases to silver nitrate application, II) the necessity of a medical professionals for its application, and III) risk of periumbilical burn with chemical cauterization [5,10]. Umbilical cord care is a potential factor affecting cord separation time and may show close relation with the granuloma formation. Despite dry cord care has been found to be effective in developed countries, cord care with antiseptics continues to be advocated in developing countries . Method of cord clamping has also been suggested as a potential factor which may modulate the granulomatous process. In their prospective study, Al Siny et al. suggested that proximal clamping of the umbilical cord for 24 hours is a very simple and effective method that reduces the incidence of local umbilical infection and consequently prevents the development of umbilical granuloma. However further studies are warranted to determine the exact role of cord clamping techniques on granuloma formation. In addition to silver nitrate application, some other therapeutic options have been shown in (Table 2). These include dressing with alcohol and other antiseptic solutions, topical home salt or steroid application, suture ligation, surgical excision, electrocautery, and cryotherapy [3,10,19,23]. Despite spontaneous regression of the untreated granulomas is not well-documented, some authors recommend clinical follow-up (dry care) without any medication or intervention [2,9]. Whichever treatment method is used, it is essential to keep the diaper folded below the umbilicus in eliminating contact of a wet diaper with the granuloma, which allows rapid epithelization of the granuloma. Table 2: Treatment options for patients with umbilical granuloma. Conventional treatment of umbilical granulomas with silver nitrate is a worldwide practice. Although antiseptic effects of silver nitrate are remarkable, it has astringent/caustic effects as well. These effects are responsible for its therapeutic role, but adjacent healthy tissues may be damaged if silver nitrate is contacted. Especially, pencil like preparates consisting of %100 silver nitrate (100%) should be touched the lesion with a great caution. Otherwise it can cause chemical burn in surrounding skin (Figure 2) . Therefore, sticks or Q tip applicators consisting of 75% silver nitrate and 25% potassium nitrate (HemoStop™, Bray™, Grafco™, etc.) should be preferred for chemical cauterization. Before silver nitrate application, umbilical area should be cleaned with an antiseptic solution and dried with a sterile sponge . Surrounding skin may be protected by petroleum jelly (Vaseline™) . Care should be taken touching the applicator just on the granulation tissue. If the granuloma persists after 3 or 4 applications which are performed an interval of 3-4 days, other potential diseases or alternative treatments should be considered . It should be kept in mind that umbilical polyps do not respond to silver nitrate application. Figure 2a: Correct silver nitrate application. Figure 2b: Please note intact skin epithelium adjacent to the granuloma. Incorrect silver nitrate application can cause to burn (black arrows) in the surrounding skin. 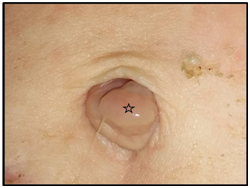 Especially, small granulomas needs a special attention during the procedure (star-shaped icons indicate the granulomas cauterized). The initial evidences related to salt treatment is based on lesser quality studies conducted in developing countries [25,26]. However results of this pragmatic method appear to be consistent and indicate a good clinical outcome. Although different methods have been determined for salt application, general principals are similar [5,27]. This procedure is painless and non-invasive for the baby and does not require frequent medical visits at the home or hospital. First, umbilical area is cleaned with a wet cotton pad, and then a pinch of crystal salt is sprinkled on the granuloma. Following this, granuloma is closed with an adhesive drape. The drape is opened 30 minutes after the procedure and the application procedure is terminated. This process is repeated 3 times a day for 3 consecutive days. Kesaree et al. reported 100% success rate in their study population. In a prospective study, Hossain et al. found that table salt application resulted in excellent outcome in 91.7% of their patients. Despite silver nitrate treatment group achieved good results, the authors did not recommended it because of small burns and pain at the umbilicus in some patients. Given these findings, it can be concluded that salt application is a reasonable option if a medical personnel who will apply silver nitrate safely cannot be found. Excision of the granuloma needs an experienced physician, usually a surgeon, sterile conditions and equipment. Therefore, routine use of it is not practical. However, excision is the treatment of choice in larger granulomas or recurrent/intractable cases [9,23,29]. As a more practical approach, excision and chemical cauterization of the umbilical base may be combined in relatively big granulomas with a wide root. In this case, excision can be achieved by crushing the root of the granuloma with a clamp and the remaining stump is applied silver nitrate. Nagar et al. reported that umbilical granulomas can be successfully treated by excision in office conditions. In their series, 302 patients were applied a hemostatic agent (Gelfoam™ or Surgicel™) immediately following the excision. If the granuloma is excised, it should be histopathologically examined to rule out any embryologic (vitelline duct or urachal) remnant, which require further investigation. In addition to the above mentioned therapeutic options, some invasive procedures (electrocautery, cryosurgery, and double ligation) or non-invasive methods (applying antiseptic solutions or topical steroids/antibiotics, and clinical follow-up without medication) have been defined to treat the granulomas [6,19,27,30]. Small patient groups, patient heterogeneity and low degree of evidences are limiting factors in these studies. Electrocautery and cryotherapy have been successfully used in limited number of cases . However both of them need equipped clinics with special devices, increasing cost of the procedure. In a small series, cryotherapy offered a more rapid healing compared with electrocautery and some chemicals. Skin discoloration has been reported as a complication of these procedures. Lotan, et al. suggested double ligation of the pedunculated umbilical granulomas as an office/policlinic procedure. In this technique, to insert the second suture (3/0, 4/0 silk) at the base of the granuloma, first ligature is pulled up during second ligation. The authors reported satisfactory outcome in terms of functional results and cosmetic appearance. The only complication was bleeding risk which was seen in broad-based granulomas. Beyond the author’s suggestion, weakness of this technique is that it cannot be applied to small granulomas in which a significant number of the granulomas are small-sized. In addition, even in pedunculated granulomas, the risk of breaking off and bleeding should be considered due to very friable structure of the granulomas. Many antimicrobial agents have been used to reduce colonization rates of umbilical stump, including alcohol, triple dye, bacitracin, silver sulfadiazine, povidone-iodine, chlorhexidine, and hexachlorophene [5,11]. However their effects on the granuloma formation have not been studied sufficiently. Daniels, et al. suggested a change in their current practice to initial conservative management (use of alcoholic wipes at each nappy change) followed by cauterization only when conservative treatment fails. Whereas Brodsgaard et al. found that silver nitrate and clobetasol propionate were significantly superior to ethanol wipes in the treatment of the granulomas. Indeed, most of the agents mentioned above cause delay in cord separation and may initiate granuloma formation . Therefore, no recommendations to support a routine use of topical antiseptics/antibiotics in the prevention or treatment of the umbilical granulomas in healthy infants can currently be made on the basis of the present literature. Recently, topical clobetasol propionate has been used in 109 patients with umbilical granuloma . The authors compared three different therapeutic agents: I) silver nitrate, II) clobetasol propionate, and III) ethanol, and found that treating the granulomas at home with topical clobetasol propionate was as effective as topical silver nitrate in the clinic. Therefore, the authors suggested use of clobetasol propionate cream as an alternative to silver nitrate. However, in Aydın et al. , topical clobetasol propionate has been held for responsible in suppressing hypothalamic-pituitary-adrenal axis. So, they suggested use of it in children older than 12 years old. Although there is lack of evidence about etiopathogenesis and the best treatment option for the umbilical granulomas, following recommendations can be extracted from the present literature: I) most of the umbilical granulomas can be diagnosed through systematic medical history and physical examination, II) treatment options should be individualized considering facilities of the family and health center, III) silver nitrate application can be considered as a first line treatment for the patients who can easily access the clinic or hospital, IV) the patients who will not maintain their medical care in a health center can undergo salt application, V) further work-up or surgical intervention (ligation, excision) may require if silver nitrate or table salt application is unsuccessful, VI) it should be kept in mind that, both poor hygienic condition and delay in medical care may result in severe local infection (omphalitis) or sepsis. Pugh MB (2000) Steadman’s Medical Dictionary. (27th edn), Lippincott Williams & Wilkins, Baltimore, USA, p. 769. O’Donnell KA, Glick PL, Caty MG (1998) Pediatric umbilical problems. Pediatr Clin North Am 45(4): 791-799. Rennie JM (2012) Examination of the newborn. In: Rennie JM (Ed. ), Rennie & Roberton’s Textbook of Neonatology. (5th edn), Churchill Livingstone Elsevier, China, pp. 254-255. Nagar H (2001) Umbilical granuloma: a new approach to an old problem. Pediatr Surg Int 17(7): 513-514. Hossain AZ, Hasan GZ, Islam KD (2010) Therapeutic effect of common salt (table/cooking salt) on umbilical granuloma in infants. Bangladesh J Child Health 34(3): 99-102. Assi AN, Kadem MK, Al Rubaee RJ, Atshan FG (2010) Management of umbilical granuloma. Thi-Qar Medical Journal (TQMJ) 4(4): 82-87. Benirschke K, Burton GJ, Baergen RN (2012) Anatomy and pathology of the umbilical cord. In: Benirschke K, et al. (Eds.) Pathology of the Human Placenta. (6th edn), Springer, Berlin, Germany, pp. 309-375. Pomeranz A (2004) Anomalies, abnormalities, and care of the umbilicus. Pediatr Clin North Am 51(3): 819-827. Rakotomalala JH, Poenaru D, Mayforth RD (2011) Disorders of the umbilicus. In: Ameh E, et al, (Eds.) Paediatric Surgery: A Comprehensive Text for Africa. Global HELP Organization, Seattle, USA, Ch 57, pp. 352-357. Wilson CB, Ochs HD, Almquist J, Dassel S, Mauseth R, et al. (1985) When is umbilical cord separation delayed? J Pediatr 107(2): 292-294. Stoll BJ, Kliegman RM (2004) The Umbilicus. In: Behrman RE, Kliegman RM, Jenson HB. Nelson Textbook of Pediatrics. (17th edn), Saunders, Philadelphia, USA, pp. 608-609. Brady M, Conway AB, Zaenglein AL, Helm KF (2016) Umbilical granuloma in a 2-month-old patient: histopathology of a common clinical entity. Am J Dermatopathol 38(2): 133-134. Lipnick RN, Illiopoulos A, Salata K, Hershey J, Melnick D, et al. (1996) Leukocyte adhesion deficiency: report of a case and review of the literature. Clin Exp Rheumatol 14(1): 95-98. Mshelbwala PM, Sabiu L, Chirdan LB, Ameh EA, Nmadu PT (2006) Persistent umbilical discharge in infants and children. Ann Trop Paediatr 26(2): 133-135. Hutson JM, Beasley SW (2014) The Umbilicus. In: Hutson JM & Beasley SW (Eds. ), The Surgical Examination of Children. (2nd edn), Springer-Verlag, Berlin, Ch 6, pp. 75-82. Meltzer DI (2005) A newborn with an umbilical mass. Am Fam Physician 71(8): 1590-1592. Snyder CL (2007) Current management of umbilical abnormalities and related anomalies. Semin Pediatr Surg 16(1): 41-49. Lotan G, Klin B, Efrati Y (2002) Double-ligature: t treatment for pedunculated umbilical granulomas in children. Am Fam Physician 65(10): 2067-2068. Kondrich J, Woo T, Ginsburg HB, Levine DA (2012) Evisceration of small bowel after cauterization of an umbilical mass. Pediatrics 130(6): e1708-e1710. Montes-Tapia F, Garza-Luna U, Cura-Esquivel I, Gaytan-Saracho D, de la O-Cavazos M (2012) Appendico-umbilical fistula: cause of umbilical mass with drainage. J Pediatr Gastroenterol Nutr 55(5): e133. Gaylord NM, Yetman RJ (2013) Perinatal disorders In: Burns CE, et al. (Eds.) Pediatric Primary Care (5th edn), Elsevier Saunders, Philadelphia, USA, pp. 961-999. Cilley RE (2012) Disorders of the umbilicus. In: Coran AG, et al. (Eds). Paediatric Surgery (7th edn), Elsevier-Saunders, Philadelphia, USA, pp. 962-972. Chamberlain JM, Gorman RL, Young GM (1992) Silver nitrate burns following treatment for umbilical granuloma. Pediatr Emerg Care 8(1): 29-30. Derakhshan MR (1988) Curative effect of common salt on umbilical granuloma. Iran J Med Sci 23(3&4): 132-133. Kesaree N, Babu PS, Banapurmath CR, Krishnamurthy SN (1983) Umbilical granuloma. Indian Pediatr 20(9): 690-692. Farhat AS, Mohammadzadeh A (2008) Comparison between two and twenty-four hours salt powder in treatment of infant umbilical granuloma. Iran Red Crescent Med J 10(4): 267-269. Sheth SS, Malpani A (1990) The Management of umbilical granulomas with cryocautery. Am J Dis Child 144(2): 146-147. Poenaru D (Education Committee, Canadian Association of Paediatric Surgeons) (2001) Disorders of the umbilicus in infants and children: a consensus statement of the Canadian Association of Paediatric Surgeons. Paediatr Child Health 6(6): 312–313. Brodsgaard B, Nielsen T, Molgaard U, Pryds O, Pedersen P (2015) Treating umbilical granuloma with topical clobetasol propionate cream at home is as affective as treating it with topical silver nitrate in the clinic. Acta Paediatr 104(2): 174-177. Daniels J, Craig F, Wajed R, Meates M (2003) Umbilical granulomas: a randomised controlled trial. Arch Dis Child Fetal Neonatal Ed 88(3): F257. Medves JM, O’Brien BA (1997) Cleaning solutions and bacterial colonization in promoting healing and early separation of the umbilical cord in healthy newborns. Can J Public Health 88(6): 380-382. Aydin M, Orman A, Deveci U, Taskin E (2015) Topical clobetasol propionate may not be safe for treating umbilical granuloma in infants. Acta Paediatr 104(2): e49.